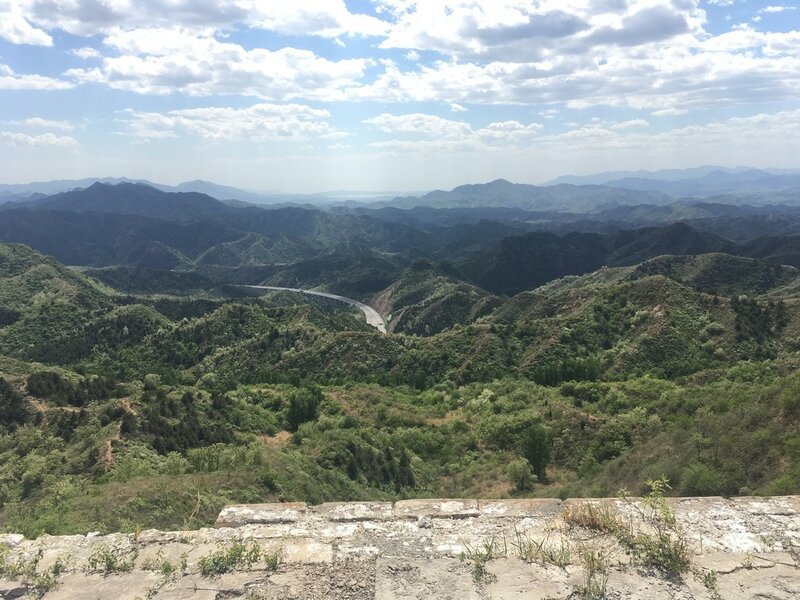 This is part of my China trek series and today on day 5 the trek starts from Jinshanling. 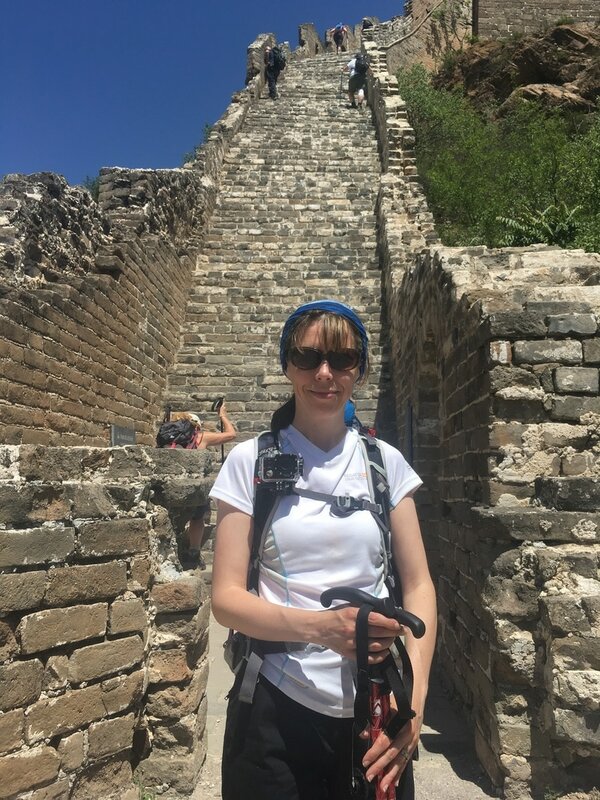 We had walked to our accommodation yesterday after a challenging day covering 27 watch towers across remote sections of the wall. The trek today would take us to remote original sections of the wall, mostly in good condition with a few ruined sections. It was to be another long day, challenging and tough and would prove to be one of the most memorable and emotional. 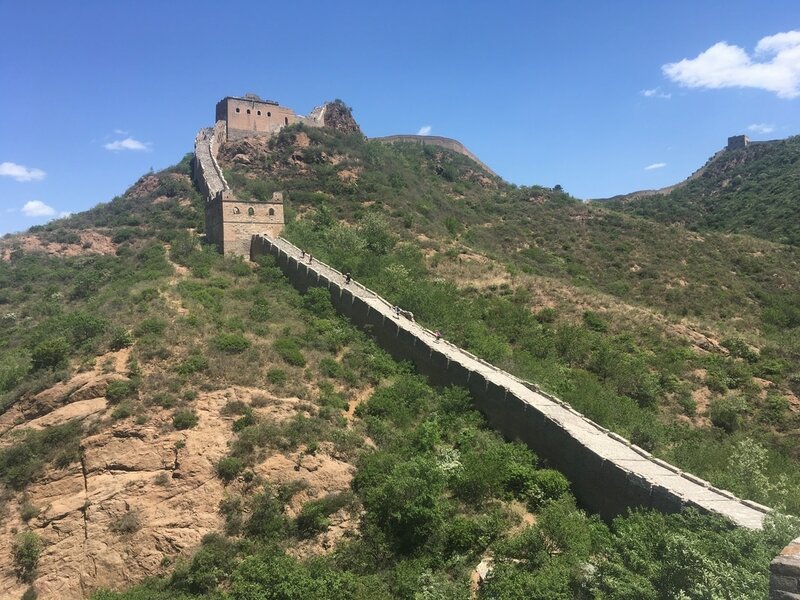 We were to walk twenty watch towers before a stop for lunch, our guide describing that there were many undulating sections. 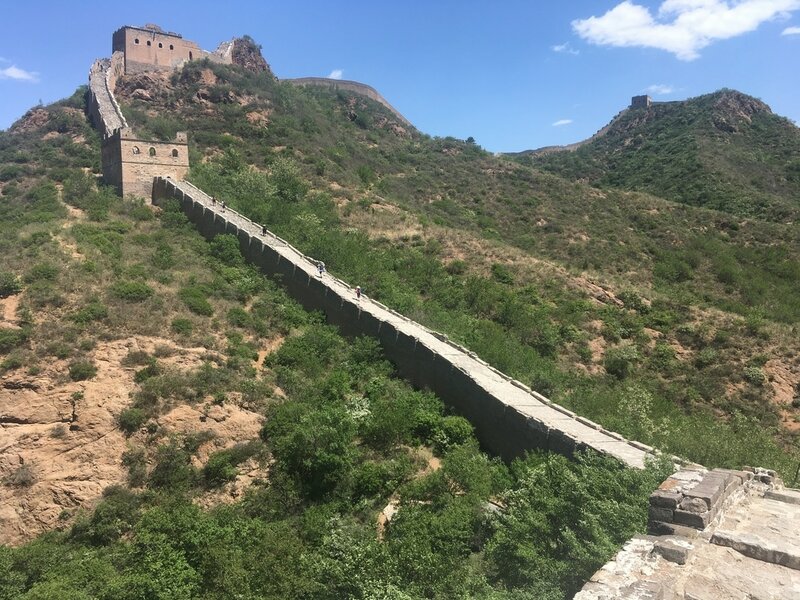 This became a bit of a joke and we soon came to realise if our Chinese guide Michael said ‘undulating’ it was going to be relentless ascents and descents of steep steps. 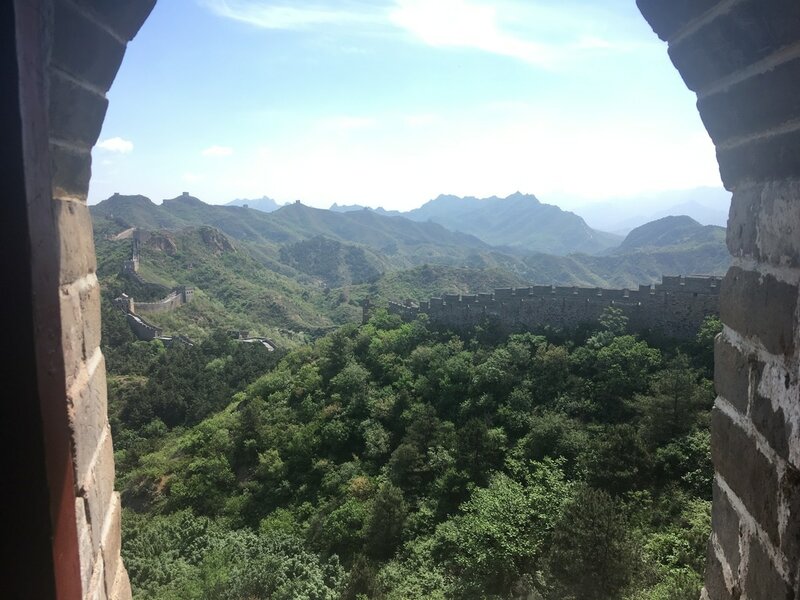 I know I go on about views being spectacular or amazing but the views here of the mountains are absolutely incredible as the wall snakes its way over the mountain ridges. The going was tough, again the heat over 30° and we came to a particularly steep slope where it was hard not to walk on tiptoes. 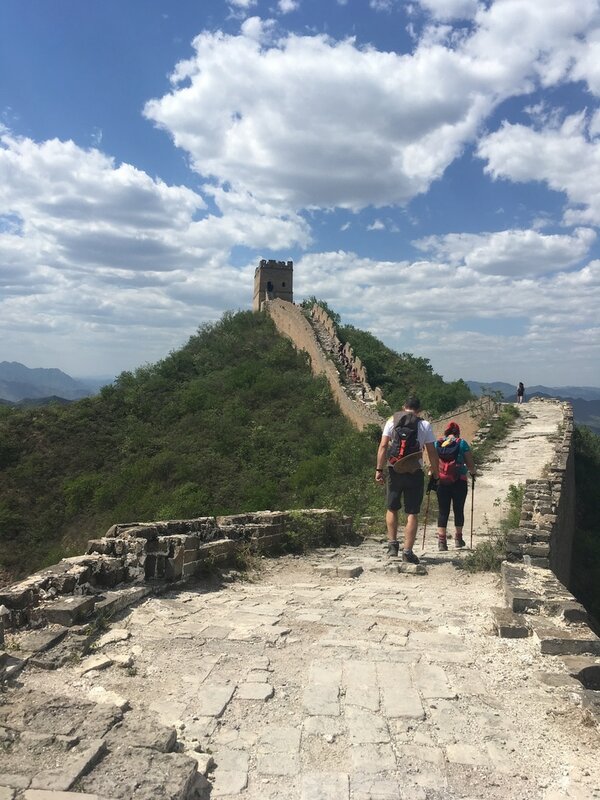 It looked impossible to walk up with the angle of the slope and I was wondering how on earth the people at the front of our group had done it. Friendly faces were at the top of the slope and a couple of the trekkers who had made it up first made their way back down to give advice and encouragement. They told us we were doing great and counted us up in small sections, it was the encouragement I needed and I managed the slope. 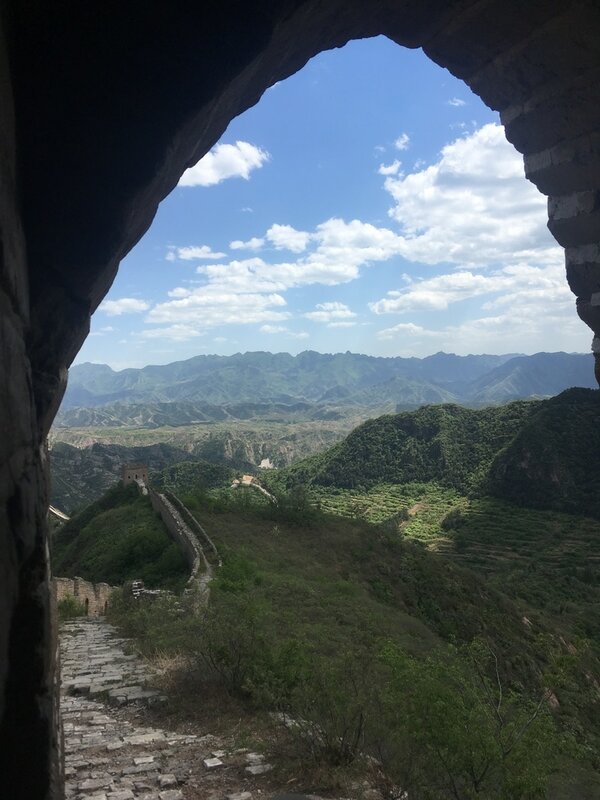 I had heard some cheering from other trekkers ahead of me and wondered what was going on as I climbed the last flight of narrow steps into the watch tower. The sight as I made it into the doorway is something I’ll never forget. 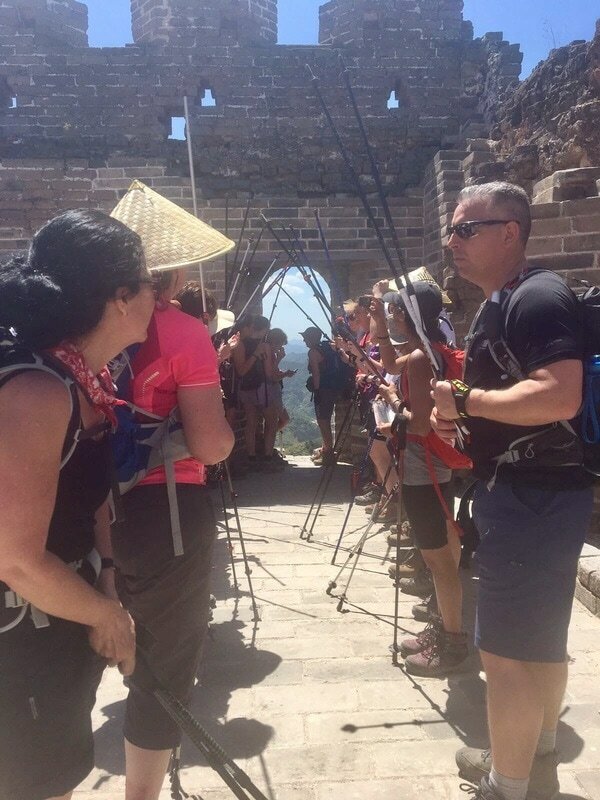 People lined the watch tower and had made an arch of trekking poles that they were tapping as they sung ‘The Grand old duke of York’, as every trekker made their way through the doorway there was cheering and singing. I was completely overwhelmed as I joined the line to welcome the next person and the tears flowed, it was so emotional and I wasn’t the only one to have a few tears. The enormity of what I was achieving and what I had overcome to be able to do this trek had hit me. Also, the amazing camaraderie of our group and how 38 strangers had come together to help each other through the tough bits. 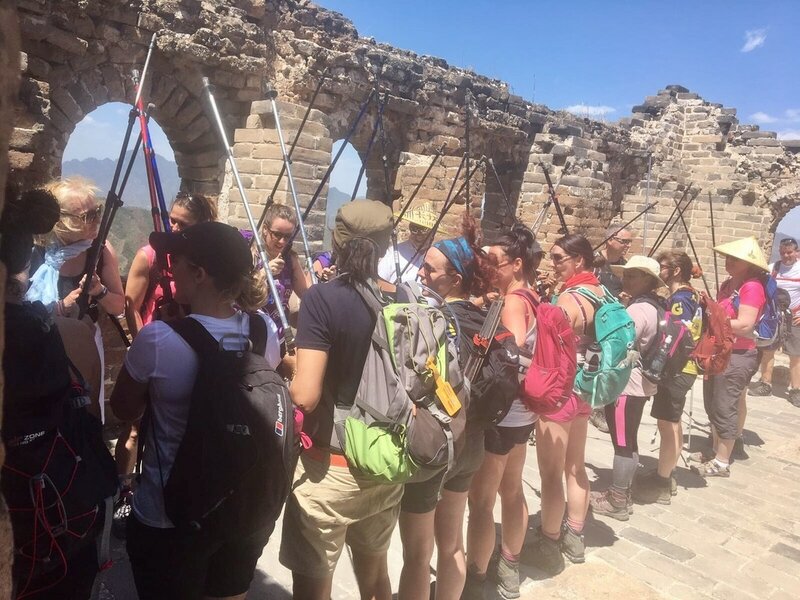 We were supposed to stop at watch tower twenty that day with those who fancied an extra challenge carrying on for another three and then walking back to join anyone who had stayed behind, making a day of 26 watch towers. 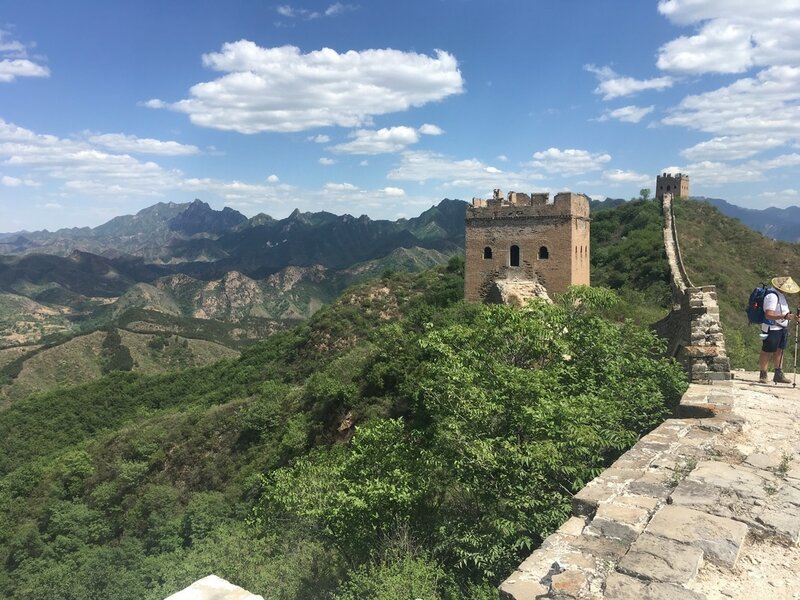 It was hard going and even though I had the euphoria of earlier making it up the slope and the singing I wasn’t sure I’d be able to do an extra six watch towers. There was lots of climbing down steps taller than me and some very tricky sections. My hips were feeling good but I wasn’t sure how far I could push myself with lots of leg work. It wasn’t until I seemed to have lost a few people and me and a lovely lady were on our own that we came across one of the trek leaders. We asked about the others behind and he made some comment about them having a rest but we were carrying on. We then made it past a few more watch towers and found our group sat having lunch and we joined them inside a watch tower on the floor. 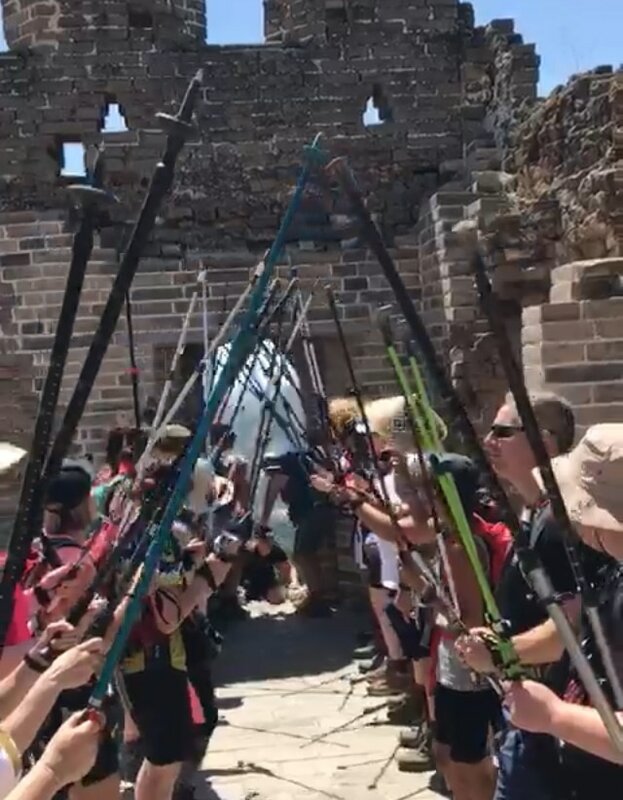 It was then revealed to us that we had already done the extra three towers and were with the group who had carried on for an extra challenge. I laughed, I did wonder if our leader had a twinkle in his eye when he told us we were carrying on! If this was a difficult as it was going to get I knew what to expect on the way back at least. Having reached the highest point, we turned back and made the long walk back down to where our coach was waiting. More steps and a long way back I’d done the toughest part but as we walked back down my back was aching and my backpack wasn’t helping. We were almost in single file again although the steps were in good condition but I needed to step to the side for a moment and let people past if only to relieve my back for a moment. The people around me stopped with me and in minutes my backpack was taken from me and ladies kindly carried it off to the bottom of the hill for me. The kindness of people was amazing and I made it down to the bottom with everyone else feeling a lot better. Our accommodation that evening was at a hotel with a proper shower and pillows, and we had a lovely Chinese meal in the hotel restaurant. In our evening briefing we were told about the brick we would be able to place in the wall as part of a restoration project with a special note dedicated to whoever we wanted. That set the tears off again on what had been a brilliant but emotional day. I went to bed proud of myself that I had walked the extra watch towers. 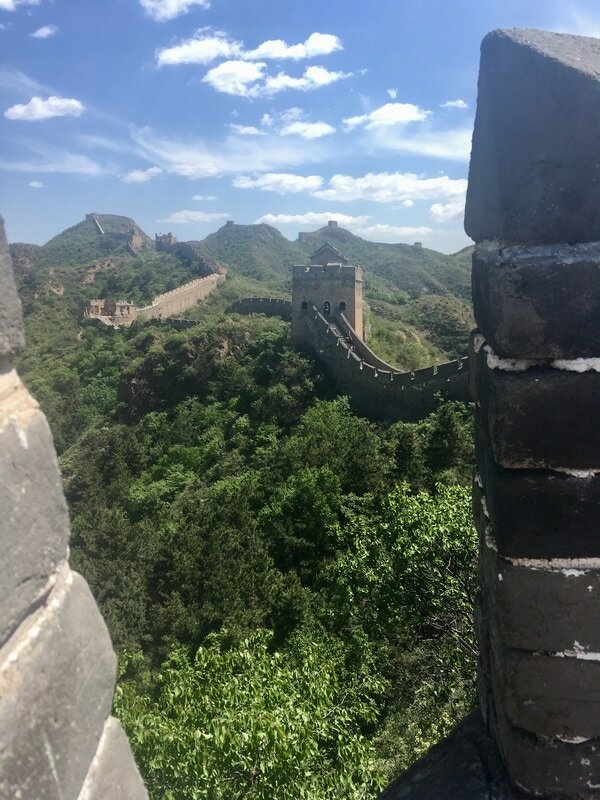 In my next blog, we tackle some of the most famous parts of the wall, climbing 1,000 steps before 496 more up to the Heavenly ladder. For more photos and videos of our Hip2trek adventures check out my Facebook page. 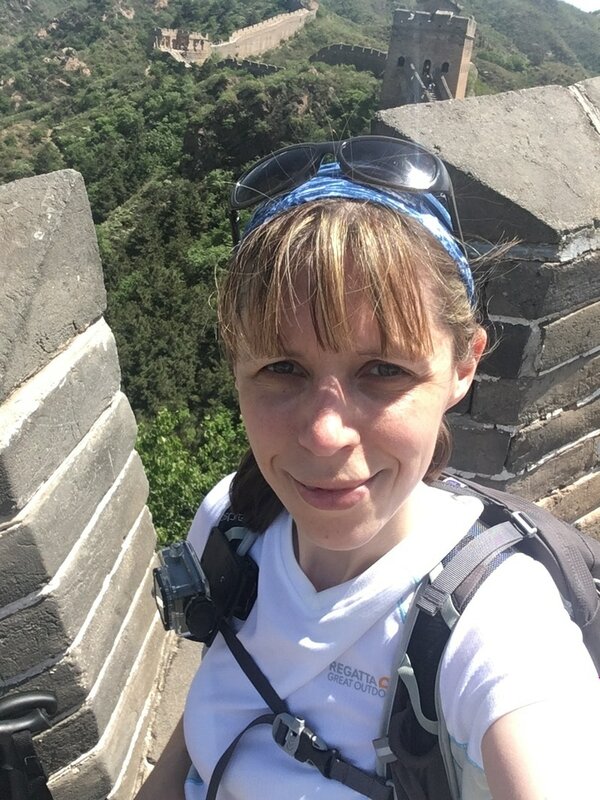 Thank you to my fellow trekkers, my ‘China Family’ for the use of some of their photos. ​Have you trekked anywhere? I’d love to hear about where you’ve visited.